Lakes Park is a place for all of the southwest Florida community to enjoy. Visitors can relax, exercise and explore at Lakes Park with several miles of paved and unpaved trails, boardwalks, canoeing and kayaking, fishing, picnicking and bird watching. Visitors can also enjoy our gardens, reserve shelters for private parties, and enjoy tours throughout the park. Lakes Park also hosts many community events, including the Farmers Market, The Lakes Park Fall Festival featuring Scarecrows In The Park, StoryTime in the Garden, and more. The history of Lakes Park is a study in the majesty and strength of nature. As late as the 1960s, this beautiful preserve was a man–made quarry. Transformed by time into a haven for wildlife and nature lovers, it is a monument to the enduring power of nature. Purchased by Lee County in 1978, the park was developed in 1984 for the community to enjoy. With the help of Hurricane Charley in August 2004, many invasive exotic trees were downed throughout the park, helping to validate the drastic need for removal of this vegetation which resulted in the park escalating its exotic removal program. Over the past several years, new playgrounds and water parks have been added, the Miniature Train & Railroad Museum and new concession facilities with food sales, bike and watercraft rentals have been expanded. No Alcohol, Pets, or Electric / Motorized Vehicles at any time. Food service offered at concession facility. For upcoming events and more information, visit www.LakesPark.org , call 239-533-7575 or email info@LakesPark.org. What's Happening at Lakes Park? Every year, the Southwest Florida community enjoys the natural beauty of Lakes Park for exercise and family recreation. Additionally, special events such as Scarecrows in the Park, Farmers Markets and Garden Tours make Lakes Park a place for the community to gather and celebrate. We believe everyone should benefit from the beauty and fun available at Lakes Park. That’s why we’ve created the E.Z. 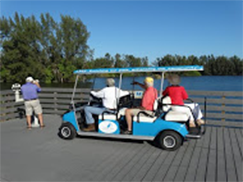 Rider Lakes Park Assisted Tour Service for elderly or visitors with medical conditions that prohibit or limit physical activity. Click here to learn more and to reserve your E.Z. Rider Tour!